Light rain began at start of R1G1 and carried with varied strength through all four rounds. Simon Pagenaud set inaugural track record lap of 1:09.6716 in round 1. 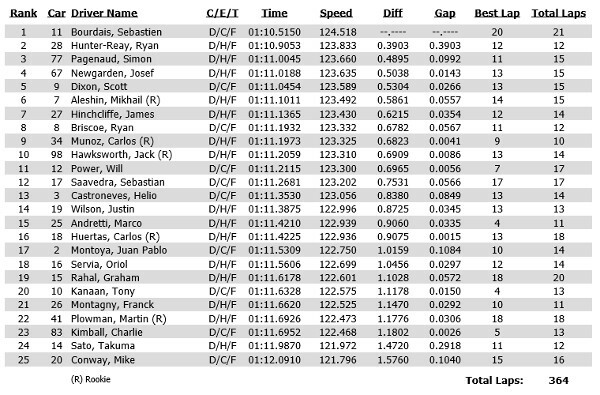 R1G2: 7-Aleshin penalized fastest two laps for interference on 11-Bourdais, causing 15-Rahal to advance to Round 2. R3 is aborted for heavy rain. Resumes after 14-minute delay with full 10-minute session. 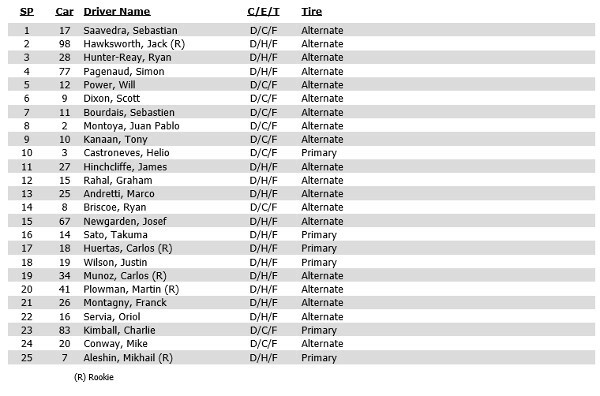 R3, 8:00: Red flag for 28-Hunter-Reay, who spins in turn 14 and makes hard rear contact with frontstretch wall. 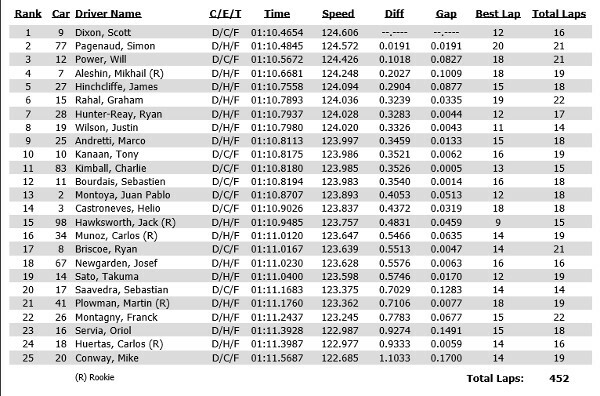 Hunter-Reay loses two fastest laps for causing red flag and drops from P1 to P3; pole awarded to 17-Saavedra. Session run in wet conditions. 13:00: Red flag for 8-Briscoe who spins off course in turn 4. Car makes light contact with tire barrier. After assistance, returns to pit lane under own power. 45:00: Red and checkered flags after 7-Aleshin spins at exit of turn 6. Group 1: 3-Castroneves, 12-Power, 17-Saavedra, 18-Huertas, 25-Andretti, 26-Montagny, 27-Hinchcliffe, 28-Hunter-Reay, 34-Munoz, 67-Newgarden, 77-Pagenaud, 83-Kimball. Group 2: 2-Montoya, 7-Aleshin, 8-Briscoe, 9-Dixon, 10-Kanaan, 11-Bourdais, 14-Sato, 15-Rahal, 16-Servia, 19-Wilson, 20-Conway, 41-Plowman, 98-Hawksworth. 9:00 – 18-Huertas penalized with a drive-through for a pit speed violation. 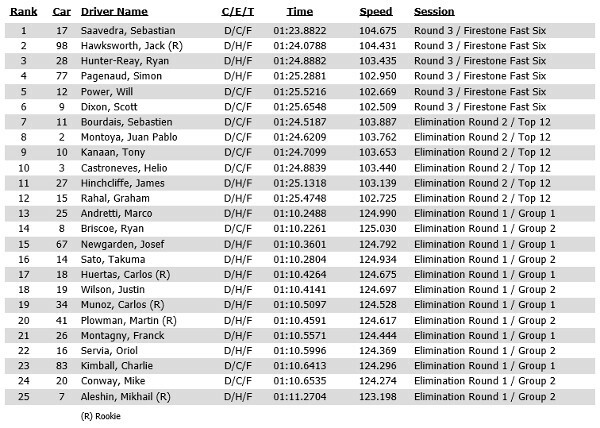 Two penalties were issued to drivers for being late to the mandatory post-practice weigh-in this morning: 98-Hawksworth (session two truncated by 3 minutes) and 67-Newgarden (session 2 truncated by 6 minutes). 15:00: Red flag for 67-Newgarden, who runs off course in turn 4. Car is assisted by Holmatro Safety Team and returns to pit lane under own power. 29:00: Red flag for power outage in Race Control.